Back in 2004, while working for eBay in The Netherlands, I was able to work on an interesting project. The project was code named Manhattan, and resulted in the acquisition of the largest classifieds site in The Netherlands, Marktplaats.nl, and eBay’s entry into the classifieds business. Just last week, eBay bought another classifieds site, in Belgium. The classifieds business has become an important source of revenue for eBay Inc. an important school for learnings and a breeding ground for top talent who would migrate to other countries while working for eBay. The decision to buy Marktplaats for $300 million in 2004 was not a fast and easy decision. The team in The Netherlands conducted a lot of research on the Marktplaats customers, the business model, and the sites ability to grow traffic and monetization to grow revenue. One of the research questions the team tried to answer was the affinity of the Dutch consumers to use the classifieds site over the eBay auction model. It turned out from part of our research, that the Dutch consumer would be willing to drive from one end of the country to the other end just to save a couple of Euro’s. And with the country of The Netherlands being rather small, you can drive from the upper Northern part to the most Southern tip in a couple of hours, no seller is to far to quickly pick up your new DVD or piece of clothing. That was 2004, now 9 years later, more data has become available through Marktplaats itself in a cbs publication. (CBS is the official state bureau for statistics in The Netherlands. The study is in Dutch) I stumbled on this data through the Facebook postings of some of my old colleagues. 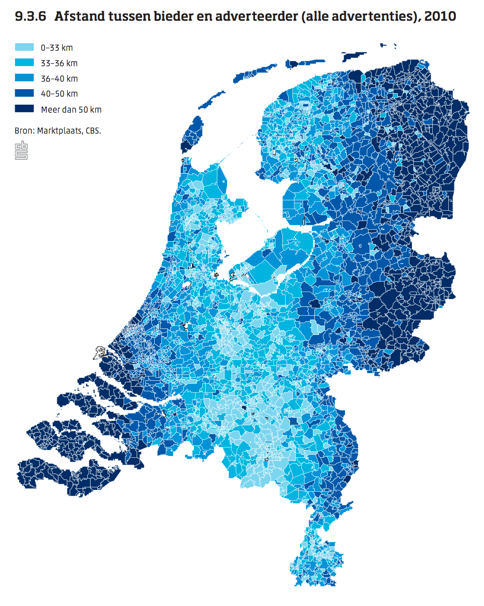 The research shows some interesting maps and how the population of The Netherlands is using Marktplaats.nl to buy and sell stuff. There is one map which shows exactly more in depth results of the research we did in the run to the acquisition of Marktplaats; how far are buyers prepared to travel to pick up the item for sale, and maybe even hackle over the price to save a little. Check out the map below, which shows the distance between buyer and seller for all ads placed on Marktplaats in 2010. The table below shows the distance between buyer and seller for each of the items in the different categories, where it shows that the distance becomes smaller the more expensive or heavier the item is. Makes sense, as some of the smaller items, which also do not cost that much, might be mailed to the buyer after the successful bargaining. Marktplaats turned out to be a very successful acquisition for eBay, not only for the direct revenue growth, but more for the learnings on the business model and its ability to grow into new verticals and grow revenue. 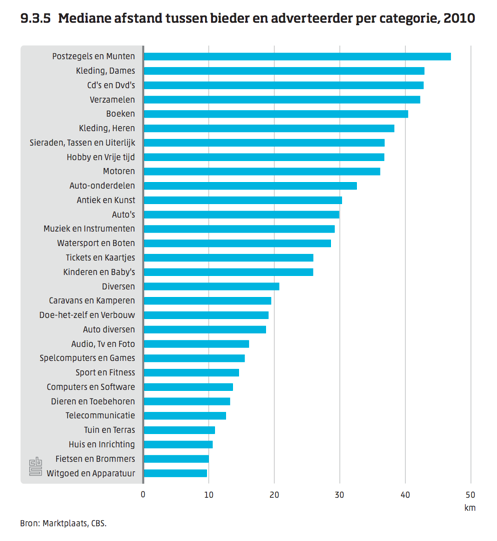 The research we as a team conducted proved to be on the mark, where years later the market still shows the winning business model for The Netherlands is classifieds rather than the eBay classic auction model.